NKS is one of footballs most respected authorities on special teams skills. 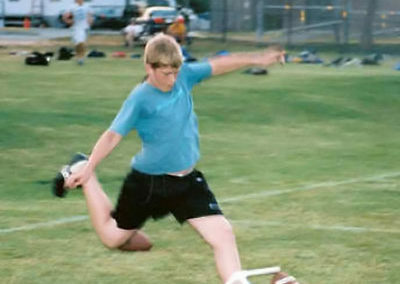 We have helped thousands placekickers, punters, and long snappers at every level. 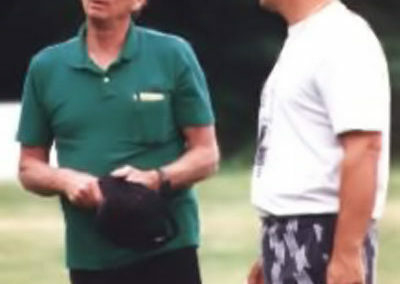 Since 1988 one of the most respected authorities on special teams skills. NKS is a full time operation. We are always there for you with programs throughout the year designed to take your skill to the next level and showcase your talent. Sports Biomechanics – Ground breaking scientific techniques ascertained through exhaustive research in the biomechanics laboratory. 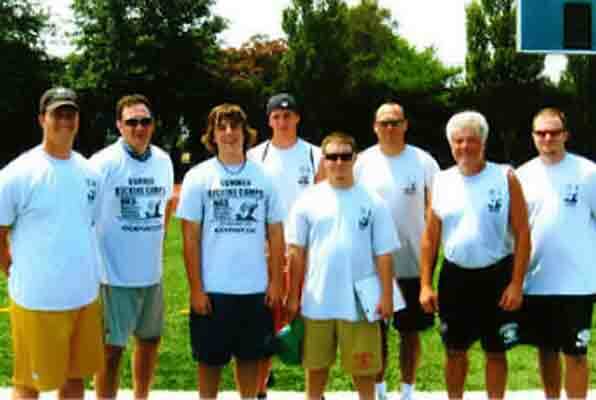 Professional NKS Staff Members are all dedicated coaches, current or former pros, thoroughly trained in the NKS methodology of kicking, punting, and long snapping. Their passion and love for the sport of football make them superb role models. 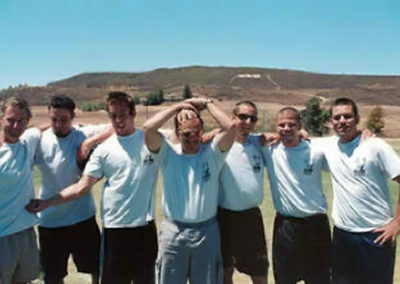 Our College Camp Counselors are all highly experienced NKS program veterans with maturity beyond their years. NKS Camps use no part time “celebrity” or guest instructors who may appear only for pictures or autographs. Our NFL staff fully participate for the entire camp and are always accessible. Individual attention is always # 1 at NKS. Our staff to camper ratio policy is never to exceed 1:7. NKS service is all about you. All players attending an NKS program automatically retain Coach Muriaty and staff as their own personal consultant throughout the year. Contact us anytime for assistance. You’ll never get lost in the numbers with us! NKS Camps are never combined with another skill or camp operation. Sport Psychology – NKS employs the very latest breakthroughs in the field of human potential on the field and in the classroom. Superior Facilities – NKS program sites are always “top notch” with some utilized by NFL teams. Our rates are always reasonable – because we respect you as a client. Parents and coaches attend field sessions and meetings FREE. College Referral Program through NKS’s vast nationwide network. NKS Camps are a blast! This enthusiasm leads to enhanced performance. 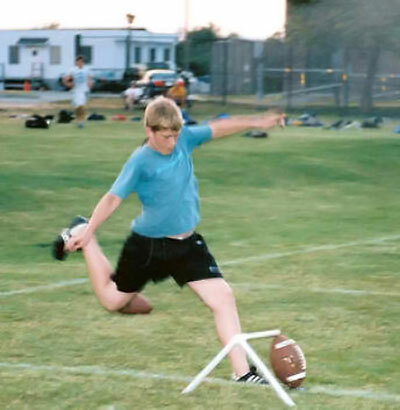 National Kicking Service kicking camps are focused and comprehensive in their scope providing the absolute best placekicking, punting, and long snapping instruction available today. It’s one thing to grasp a mechanical principle, and another to have the ability to impart that knowledge to another in the most effective way. NKS staff are thoroughly trained in teaching methodology, motor learning, and sports psychology. Individuals learn in different ways and at their own rate, utilizing varying degrees of visual, kinesthetic, and auditory feedback. NKS staff are adept at personalizing their approach to each specialist they work with. NKS camps are a complete education in the special teams skills. Our goal is to instill in each and every player the proven biomechanical techniques, training principles, focus, and mind set necessary to build confidence and perform in game situations. Individual attention is one of the NKS cornerstones whether you are a beginner, high school standout, or college star. The camp environment promotes an atmosphere where participants will feel comfortable interacting with coaches and players alike. More and more we hear professional athletes speak about having fun and how it enhances their performance. We’ve always known that at NKS and that element is incorporated into everything we do. The camps are a blast. Most players develop lasting friendships within their skill. Remember, NKS camps are three days and two nights. The benefits of an overnight camp are enormous. If you can’t stay overnight, you’ll still benefit from the extended camp schedule. Great training tables- all you can eat! All players automatically retain NKS as their personal consultant. That means Coach Muriaty and all of the staff are available anytime whether it be a question on technique, video analysis over the phone, recruiting advice, support, etc. There are NKS Staff located near each campsite for follow up instruction or help of any kind. Campers listen intently as Coach Muriaty speaks about the ability to focus on every kick. 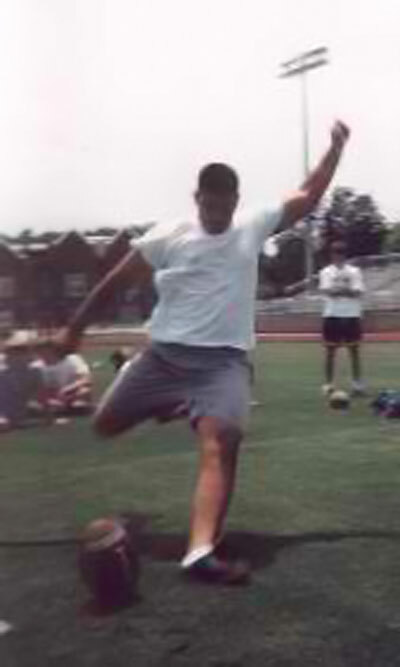 NKS History Former All American Jason Feinberg (PENN) holds for Pittsburgh Steeler kicking great Jeff Reed. Todd Jagoutz from the University of Maine Todd was an All ECAC punter, Boston Sportswriters All New England selection punter, First Team All Atlantic 10 punter, and second Team placekicker. He holds all kicking and punting records at Maine. 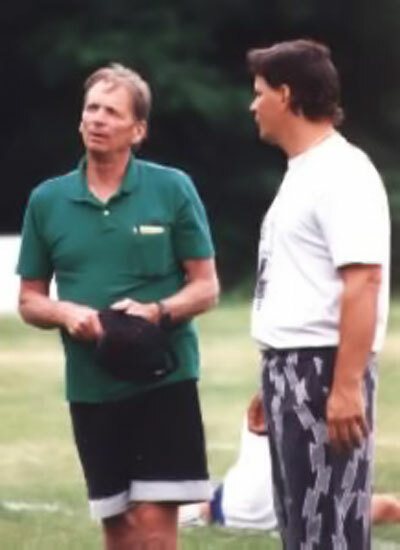 Bob Baker and Walter Pihl have over 50 years combined experience coaching kickers. Jared Davis – Temple University Four Year Academic All American at Temple University. Jared hails from Rhode Island where he was a record setting All State kicker. Xavier Beitia Former Florida State All-American. Florida All State High School Kicker out of Jesuit High School in Tampa. Signed with the New York Jets after college and accomplished a rare feat. In training camp, he made every kick in practice and exhibition games. Every kick. Xavier also played with the Tampa Bay Buccaneers, in NFL Europe, and in the Arena Football League. The camp competitions are a blast. Shown here is the McDaniel College punting competition. The playing surface is the next generation of artificial turf “field turf” which was installed by the Baltimore Ravens. Does NKS work with straight on kickers? You bet. Some of the top placekickers in the National Kicking Service program are straight on. Is soccer style kicking superior? Absolutely not. Lab and field tests prove the skills equal. The preference for each kicker is based mostly on body type and athletic experience. Here is Andy McTeague in 8th grade at the Massachusetts Maritime Academy Camp. Andy went on to star at St. Johns Prep (Massachusetts). The NKS staff and camp counselors are hard working and dedicated… but they also know how to have fun. Shown here is our West Coast Staff from left to right: West Coast Director Jim Power, Jeff Ferrier-San Jose State, Ryan Slack-Idaho State, Coach Dana Roach-Saddleback College, Mike Hughes-San Diego State, Brian Borreson-Utah, and Rafael O’Campo-San Diego. Girls attend NKS camps every year. Some notables have been Darci Hata (Hawaii), Nicki Edelman (Pennsylvania), Stephanie Weiner (Penn State), and Heidi Garrett (California). Most well recognized may have been Tonya Butler (shown here), a Georgia Scholastic All State placekicker who gained national acclaim. All levels of players attend NKS camps… Beginners, youth league, high school and college All Americans, and aspiring professionals. For most activities campers are in groups according to their age/skill level. 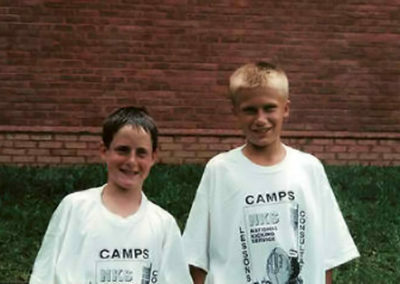 On the left is Max Shaw, age ten at the time, at the Stetson University camp in Florida. 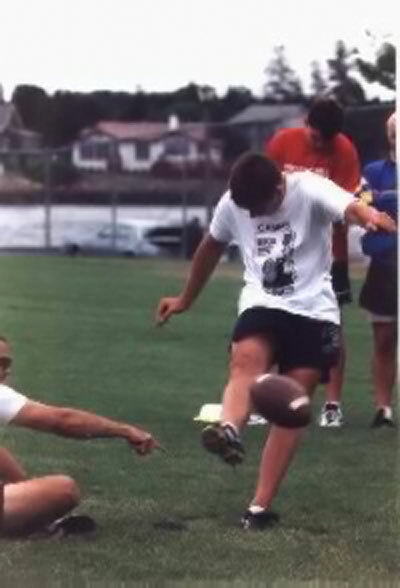 By the end of camp Max had hit a 35 yard field goal. Camp Fun Players and staff enjoy “Pizza Night” while staying at the spacious McDaniel College apartment complex. Long Snapping at NKS Camps Long Snapping Specialist Coach Bobby Prichard works with snappers at the Monmouth University summer camp in West Long Branch, New Jersey. Long snappers are an integral part of the NKS camps. Youth Division Campers While NKS summer camps attract top high school and college players across the USA they are also appropriate for ages 10 and up. It’s a huge advantage for these stars of tomorrow to be exposed to the basic sound principles of placekicking, punting, and long snapping. For most activities players are placed in their own age group. 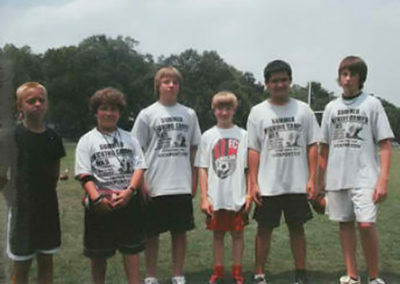 Shown here are youth division players at our Queens University of Charlotte camp. 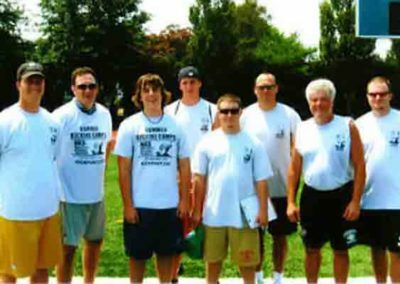 Ken Hensley (Boone High School, Orlando), Ryan Dougherty (East Carolina University, Green Bay Packers, 07, 08), Jay Wooten (University of North Carolina), Jeff Reed (UNC, Pittsburgh Steelers), Chris Stretch (Charlotte Catholic High School, Appalachian State University). Not shown: Coach Muriaty. 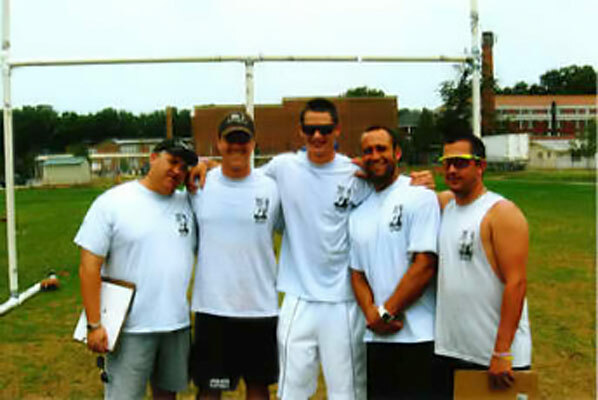 Ryan Dougherty, Coach Jeff Dinnocenti, Kevin Quicker (North Carolina Wesleyan), Rob Long (Syracuse University), Ryan Cain (King’s College – Pennsylvania), Coach Paul Schmidt, Coach Bobby Prichard, Steve Link (West Virginia Wesleyan). Jeff exhibits his signature stance to campers. Jeff has been one of the few National Football League placekickers who employ a pure two step approach.